Occasionally we here in the burgeoning tech community in Baltimore have paused to take stock about how far we’ve come, and what would be good to do next. About a year ago, Mike Subelsky made some suggestions on the BaltTech blog, and he’s recently identified some awesome emerging leaders who have made a real difference in the last year. Many of the ideas he identified are ones that people have taken up and run with. In my travels in the last year, I’ve come across several ideas that are working in other places that we should consider pursuing here – in no particular order. Startup Weekend – Bring together a bunch of startup-minded people on a Friday, form groups, and build something entirely new from scratch by Sunday. Demo it on Sunday afternoon. I had the chance to attend StartupWeekend Seoul this summer and it was a great experience. Lots of relationships were formed and some truly great ideas were unearthed. We need a big-ish place where folks can hang out for 3 days straight and someone to take the lead. Girls In Tech – This organization is a global group of women who are making a real difference in the tech community. Some have griped about the name, and I agree it’s somewhat problematic – however to their credit they are trying to do their best to attract young women involved in tech and create a culture that is at least somewhat fun and edgy. Behind the scenes, its founders and main movers and shakers are some of the most intelligent and connected emerging women leaders in the tech world; with strong leaders in China, New York, and San Francisco. I promise you that a Girls In Tech Baltimore chapter would find good connections worldwide. Hacks and Hackers – Baltimore has the critical mass to support a chapter of this group that aims to connect journalists and tech/developer people. And entrepreneurs. News here is horribly broken and it’s going to take an entrepreneurial mindset to fix it. The sooner we can get journalists and smart startup people to get to know each other better, the sooner a new model will be discovered. Get on it. TEDxBaltimore – I helped pull together TEDxMidAtlantic in 2009 and 2010, and TEDxOilSpill this summer. TEDxMidAtlantic aims to throw a spotlight on a wide range of creative thinkers in and around our entire region. Mel Brennan from YMCA of Central Maryland and Open Society Institute have been discussing a potential collaboration to help produce TEDxBaltimore, which would have the opportunity to focus on Baltimore and its future potential. I strongly support this and anyone who would like to step up will find support from YMCA, OSI, and TEDxMidAtlantic. Contrary to some recent tweets, no date has been set. Entrepreneurs Unplugged – This event in Philadelphia features an entrepreneur on stage to discuss their story, successes, and failures. As long as they can keep from lying on stage I think this could be an extraordinarily powerful format. GBTC has had a Face2Face program for several years, which avoids the tendency that entrepreneurs have to whitewash over failings and details by pulling together a very small group over dinner. Both are awesome. Reverse VC Pitch Party – My friends Larry Chiang and Dave McClure have been dreaming this one up, so VC’s can do “outreach and education and stimulate deal flow.” I think it’s a great idea and I’d love to see groups like my own Baltimore Angels as well as some of the VC firms in the region get up on stage and talk about the deals they like to see, the reasons startups should seek them out, etc. A great way to turn the tables and share perspectives that are all too often misunderstood. CityCamp – In the spirit of BarCamp and SocialDevCamp (both of which could use folks to take the charge for updated events – we’ll all help! ), CityCamp is a catalyst and a forum for talking about what’s working and what still needs to be done from an Open Government / Gov 2.0 standpoint. It’s what Baltimore City’s well-intentioned “Data Day” this summer perhaps should have been. There’s a lot of potential for involving folks from the design, architecture, and foundation community here too. Junto & Salons – Ben Franklin convened a regular gathering of smart folks in Philadelphia, many much older than himself, to discuss ideas of the day and to trade notes about what businesses had gone bankrupt and the like; he called it a Junto. Lately I’ve noticed an increasing number of evening salon conversations about politics, startups, tech and the like. Our friends in Philadelphia revived the Junto tradition a couple of years ago, with awesome results. We’ve discussed doing it here but it hasn’t happened yet. Are you the charismatic leader? Bootstrap Baltimore / Mosh Pit 2.0 – For the last two years Jared Goralnick has put together Bootstrap Maryland at University of Maryland’s College Park campus. This is a great event, and we could use something here in Baltimore that is aimed at drawing out the amazing quantity of entrepreneurial talent here in Baltimore’s many universities. A few years ago, GBTC hosted an event called MoshPit – a business plan competition for college students. We need to revive this program and meld it with something like Bootstrap. And we especially need to reach out to students in engineering, science, and the arts – not just business students. Go ahead and steal these ideas. There are plenty more where these came from. Borrowing working ideas from other places means they have a much higher chance of success than trying to design a totally new event format from scratch. Plus, it gives the potential for direct exchange with organizers elsewhere. If you are interested in pursuing any of these ideas, ping me – I can put you in touch with the originators of these events. And thanks again to everyone who has stepped up to make a real difference here. We are changing this city one mind at a time. Those of you who know me well know that idle conversation runs a real risk of becoming reality; I tend to act on impulse to create things, especially if I can see a simple (enough) path to bring them to fruition. Hence was born the idea behind Sticker Movie (working title), a documentary about the tribal meaning behind the stickers that people put on their cars. And so yesterday while working at the Hive, I tweeted that this would be a cool idea. I immediately got back about 10 responses from people who liked the idea, and so I thought this idea might have some legs. Jared Goralnick (@technotheory) suggested that a project like this might be too much to take on (especially given everything else I am doing), and if I was interested in doing it all myself, he’d be right. But, I like to do what I’ve been calling marshaling the resources of the universe. And Twitter is great at coaxing the universe into doing stuff. Efforts like @socialdevcamp, @bhivebmore, @baltimoreangels, @ignitedc are all things that wanted to happen and that I’ve helped catalyze in the last few months using Twitter — without having to do them all entirely by myself. And so it will be with @stickermovie — the first crowdsourced documentary. We are going to start by getting submissions of bumper sticker images, so we can observe broad themes and develop a potential line of inquiry for the filming. Then we’ll use the power of networks to find an appropriate production team and any necessary funding. Finally, we’ll use networks to help drive the release of the film at festivals, and if it makes it that far, we will use social networks to drive the release theatrically. So, big ambitions — no idea how it’ll work out, but I think the universe is on our side. It’s an interesting topic. Bumper stickers are a kind of modern tribal marker, and they tell us a lot about our culture and its own ambitions. If you’re interested in following the @stickermovie story, go ahead and follow us on Twitter. We’ll be starting the sticker image collection shortly, and will keep folks apprised of our progress. 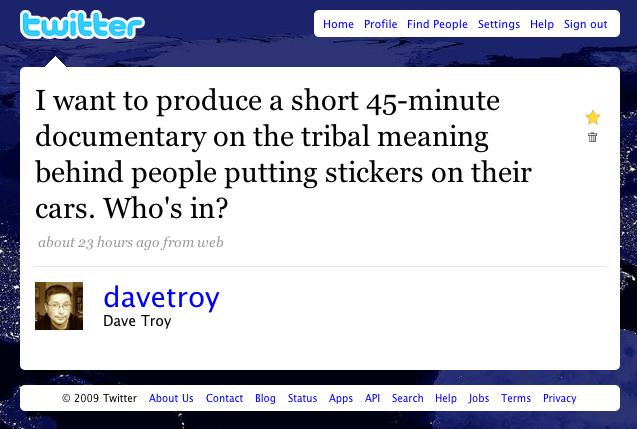 We hope @stickermovie will be another example of using Twitter to marshal the resources of the universe. Stay tuned. And start taking pictures of bumper stickers! Last time we showed that the Barcamp format is a simple design that promotes certain behaviors and outcomes. Coworking is a design that promotes a similar set of behaviors on an ongoing basis. This shouldn’t be too surprising as both ideas were conceived and developed by a lot of the same people — Chris Messina and Tara Hunt, among others. In this round, we’ll cover some of the underpinnings of the design of Coworking; in fact there is so much to cover, the next installment will be dedicated to coworking as well. Upon hearing about coworking (independent workers sharing workspace), most people immediately engage their left brains: OK, so you get a space and then split the rent — you get office amenities at a much lower cost, get out of the house, and work in a “real office.” People immediately assume it’s some kind of real estate play and is similar to the concept behind the postmodern “executive suite.” This conception is dead wrong. This faulty conception is what has led some to think they would start a “coworking space” and then wade into a lease and other commitments assuming that if they build it, they will come. Who were they building it for? The fact is there is no guarantee that anyone will ever come to any coworking space. So, these folks are left holding the bag wondering what they did wrong. They failed to build a community first. January 2009: Incorporated Beehive Baltimore, LLC with a minimal amount of capital from three partners to insure the venture’s success. Secured charter member commitments from 20+ members which would insure our monthly rent number would be covered. February 2, 2009: Grand opening day of work at the Hive with many members present. We’ve been growing and thriving ever since, hosting events like Twestival and Refresh Baltimore. Coworking has an extremely bright future in Baltimore. At each stage along the way, we used tools like Twitter, Facebook, and events to discuss the initiative and get input from our community stakeholders. We figured out who would be served by coworking, drafted them into the discussion, and at each step made sure that we had buy-in from the people who would be the primary users. A chain of dozens of decisions led to a successful outcome; at any stage along the way, failure to observe and listen to our community could have aborted our efforts. Now that our community is strong, we can exist anyplace; it’s not about the space, it’s about the people. Don’t try to “impress.” It doesn’t matter how “money” your space looks, or how “professional” it appears, or if it’s in a trendy place, or if it’s built with glass and granite. That said, having a pleasant workspace is always desirable, but people interested in coworking are generally not looking to convey a sense of status in their workspace. They are looking for community, company, and mental stimulation. You can get that in a modestly furnished workspace just as easily as in a high-rise office building. Find something that’s sufficiently good and pleasant; if you’re trying to impress people, you’re doing it wrong. “Amenities” are nice, but people cowork to be around people. The trap of “shared expenses” often leads people to assume that one of the major draws must be that you can share toys like copiers, laser printers, air hockey tables, Xboxes, and fancy coffee machines. Sure, toys are nice. But folks can get good coffee or play videogames a lot of other places. What they can’t get is collaboration and community. Do that well and let the amenities take care of themselves. Don’t overthink your rules and processes. A common worry among people not familiar with coworking in practice is that it can somehow be dominated by obnoxious personalities and that a well defined governance must be in place to manage everything. This is a huge waste of mental energy. If you build your community first and set the right pricing structure, everything will take care of itself. Communities are self reinforcing, and pricing sets disincentives for ne’er-do-wells. More on this later. Remember that people are fragile and perishable. Your first and only asset is your community. Listen to them and be sensitive to their voices. They are your stakeholders. If you start holding coworking sessions in a place on the south side of town, don’t setup a formal coworking space on the north side of town and expect the same folks to show up. People are creatures of habit and have their own natural geographic orbits. If you do have to make a major change (like location), don’t assume that just making the change will make it so. Every decision that affects the community needs to be tested and validated by the community. Don’t be afraid to lead. As a designer of your coworking community, don’t be afraid to make decisions and take steps that you sincerely believe are beneficial. The community will give you feedback if they think you need it. All groups need leadership, and don’t fall into the trap of thinking that just because coworking is a community endeavor that all decisions must be made in tortured group meetings. Your community need not be a democracy, and it’s also not a commune. Your only mission is to be effective — so take the lead. Likewise, encourage other members of your community to take the lead and make stuff happen. If you get mired in egalitarian rhetoric, you’ll accomplish nothing, and people will get frustrated. Avoid meetings: use tools like email and Twitter to stay in constant communication, and opt for one-on-one facetime when that is what’s called for. Don’t seek institutional validation. You may be tempted to leverage existing perceived power centers in your community to help “seed” your initiative. Don’t bother. It’ll come with strings attached, endless meetings, and you’ll spend lots of time explaining coworking to people who just won’t understand. Act and get things started; then await developments. Your community institutions and the press will scramble to understand what you’re doing once it’s clear you are successful. Then, you can accept partnerships that make sense: on your terms. OK, so you get the vision of coworking — that it’s about community first and that you shouldn’t try to open a space without finding that community. Suppose you find your community and you’re ready to advance it to the next step — now what? We’ll cover this next time — how to design your coworking community for maximum joy and minimum administrivia. The good news is that you don’t need an elaborate set of processes or a council of elders. On the flip side, you do need to give it some thought. But, that’s what design is: thought. See you next time — and we welcome your feedback on how you’re using design to shape your life! Twice last year, I had the experience of putting together SocialDevCamp East, a barcamp-style unconference for software developers and entrepreneurs focused on social media. Sounds straightforward enough, but that sentence alone is jam-packed with important design decisions. And those design decisions carried through the entire event, and even into its long-term impact on our community and our community’s brand. I’ll explain. In the last few years, the Barcamp unconference format, focused on community involvement, openness, and attendee participation has gained a lot of traction. I won’t write a ton here describing the format and how it all works as that’s been done elsewhere, but the key point is that this is an open event which is supported by and developed by the community itself. As a result, it is by definition designed to serve that community. So what are some other design implications of choosing the Barcamp format? Here are two big ones. First, anyone who doesn’t think this format sounds like a good idea (but how will it all work? what, no rubber chicken lunch? where’s the corporate swag?) will stay away. Perfect. 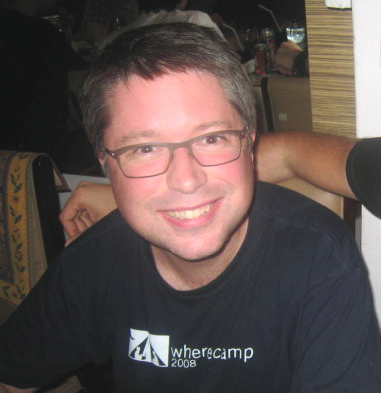 Barcamp is not a format that works for everybody – particularly people with naked corporate agendas. It naturally repels people who might otherwise detract from the event. Second, the user-generated conference agenda (formed in the event’s first hour by all participants voting on what sessions will be held) insures that the day will serve the participants who are actually there, and not some imagined corporate-sales-driven agenda that was dreamed up by a top-down conference planning apparatchik three months in advance. We could have put on a standard BarCamp, but that wasn’t really what we wanted to pursue; as an entrepreneur and software developer focused on the social media space, I (and event co-chairs Ann Bernard and Keith Casey, who helped with SDCE1) wanted to try to identify other people like us on the east coast. We chose the word Social to reflect the fact that we are interested in reaching people who have an interest in Social media. It also sounds “social” and collaborative, themes which harmonize with the overall event. We chose the wordlet Dev to indicate that we are interested in development topics (borrowing from other such events like iPhoneDevCamp and DevCamp, coined by Chris Messina). This should serve to repel folks that are just interested in Podcasting or in simply meeting people; both fine things, but not what we were choosing to focus on. Obviously Camp indicates we are borrowing the Barcamp unconference format, so people know to expect a community-built, user-driven event that will take form the morning of the event itself. We chose East to indicate that a) we wanted to draw from the entire east coast corridor (DC to Boston, primarily), and b) we wanted to encourage others in other places to have SocialDevCamps too. Not long after SDCE1, there was a SocialDevCamp Chicago. Additionally, our tagline coined by Keith Casey, “Charting the Next Course” indicates that we are interested in talking about what’s coming next, not just in what’s happening now. This served to attract forward-looking folks and set the tone for the event. We wanted to make the event easily accessible to people all along the east coast. Being based in Baltimore, we were able to leverage its central location between DC and Philadelphia. Our venue at the University of Baltimore is located just two blocks away from the Amtrak train station, which meant that the event was only 3 hours away for people in New York City. As a result had a significant contingent of folks from DC, Baltimore, Wilmington, Philadelphia, New York, and Boston, many of whom came by train. These two events, held in May and November 2008, are still reverberating throughout the region’s community. At Ignite Baltimore on Thursday, SocialDevCamp was mentioned by multiple speakers as an example of the kind of bottom-up grassroots efforts which are now starting to flourish here. The event has the reputation of having been a substantive, forward-looking gathering of entrepreneurs, technologists, and artists, and that has gone on to color how we in the region and those in other regions perceive our area. Even if it’s only in a small way, SocialDevCamp helped set the tone for discourse in our region. Design? Or Just Event Planning? Some might say that what I’ve described is nothing more than conference planning 101, but here’s why it’s different: first, what I’ve described here are simply the input parameters for the event. Writing about conference planning would typically focus on the logistical details: insurance, parking, catering, badges, registration fees, etc. Those are the left-brained artifacts of the right-brained discipline of conference design. Everything about the event was designed to produce particular behaviors at the event, and even after the event. While I make no claim that we got every detail perfect (who does? ), the design was carried out as planned and had the intended results. And of course, we learned valuable lessons that we will use to help shape the design of future events. Event planners should spend some time meditating about the difference between design and planning; planning is what you do in service of the design. Design is what shapes the user-experience, sets the tone, and determines the long-term value of an event. I’ve got at least 3 more installations in this series. Stay tuned, and I’d love to hear your feedback about design and how it influences our daily experience. WARNING – GEEK/PHILOSOPHER CONTENT: It occurs to me that the universe is a kind of finite-state automaton, and as such is a kind of deterministic computing machine. (No, I was not the first to think of this.) But if it is a kind of computer, then design is a kind of program we feed in to that machine. What kind of program is it? Well, it’s likely not a Basic or Fortran program. It’s some kind of tiny recursive, fractal-like algorithm, where the depth of iteration determines the manifestations we see in the real world. As designers, all we’re really doing is getting good at mastering this fractal algorithm and measuring its effects on reality.